I am a huge fan of author Milo James Fowler and love his twisted sense of humor and brilliant imagination. This is a short collection of short stories offering an impressive array of subjects from science fiction to paranormal to downright horror in neatly captured, manageable, small bites. Narration by Craig Waletzko adds an extra dimension. I'd have to say NOT to read or listen before dropping off to sleep unless you enjoy twisted dreams! I enjoyed each of the short stories. On the plus side they were quick and enjoyable and thought provoking. My only complaint was that they were too short. Alienated is a cool collection of short stories on an alien theme that, while complete on their own, left me wanting more. Any of these stories would be a terrific start for a book. The narrator of the audiobook does a very good job. Shorts stories are not my favourite (they always end too soon), but this collection is very interesting, everytime with the alien theme in commom. My favourite was the "Reverie", and the reader did a great job with the whispering. That and the one on the farm are the ones that leave the mind most to wonder what would come next. Still, great stories for fans of "Twilight" type shorts. 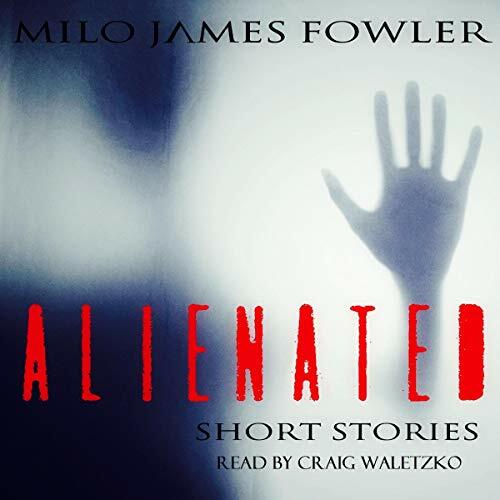 Alienated by Milo James Fowler and narrated by Craig Waletzko is an audible book I requested and the review is voluntary. This book has an excellent variety of really strange, creepy, page-turnering thrillers and each one freaked me out! I loved it! For a short short, each packed a big punch! Each has unexpected outcomes, unique plots, and the characters are like no others! The narration was excellent for these stories! Great job all around! Thanks for letting me listen to this! I love the unusual and creepy! Alienated indeed, you are going to enjoy this audio book even if you are not a fan of horror. The intro to the book was different, unanticipated and left me feeling a bit confused. I expected an overview of the coming stories. But after you hear the stories you will think it was a just right start to jump into the audio book. You know it's a horror book. Each story is unique and interesting. You feel a sense of unease and anticipation as each story builds. You think you can guess how the story ends but you may find more often that not, you were wrong. Some stories make you laugh, some are frightening or creepy. The book ends you and you feel it's to soon. Must of been awfully short but it only seems that way because you were so interested the time just flew by. I'm glad I read A!ienated. If you are listening to the stories on your drive home from work you might just sit in the car in your driveway until it ends. And then you smile. It was a good audio book.